Paper has an unusual ability to breed. Paper has no visible sexual capacity, yet it multiplies like a bunch of teenagers at a prom. One day, you set a sheet of paper on your desk, and the next you have a full blown stack, and you no longer have room for your laptop, your coffee cup, or your sanity. Determine How Long You Actually Need the Material: You don’t need to hold on to everything forever. As with books, you need to create keep or toss piles. Hang on to material relating to fellowships, financial aid, and recommendations (either for you or the ones you write for students). Think Vertically: For the paper you need later on, either punch holes in it and place it in a three-ring binder or slip the paper into hanging file folders. You’ll save space, and it is easier to sort through folders when they are upright than when they are flat. Use Meaningful Labels: Binders and files won’t do you a bit of good if they aren’t labeled efficiently, so you must get in touch with your inner librarian. For example, determine how you think of the classes you teach. Do you tend to think of them by title or by course number? Choose whichever one works for you. Then, subdivide by year to make it easier to find the older files. Create a “To-File” Box: If you don’t need a sheet of paper in the next day, then it shouldn’t be on your desk. Place the papers in a “To-File” box. Filing items right away can be tiresome, and you won’t always have enough time to do it, but the “To-File” box will help you tidy up your desk. Set Aside a “To-File” Time: A full “To-File” box is a chaotic “To-File” box. Schedule an hour or two a week, depending on how much paperwork you generate, to put the “To-File” papers in the appropriate binders or hanging folders. Filing papers is about as exciting as a stick in the eye, but the time you put into filing will save you double the amount of time later. 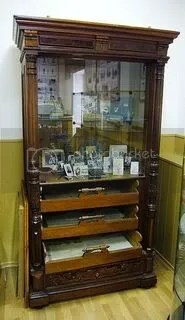 Image of old-school Moscow file cabinet by Leonid Dzhepko, posted on Wikimedia Commons under a Creative Commons license.